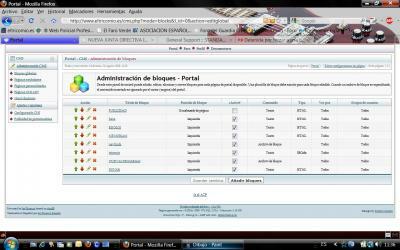 I've designed my IP with the same blocks in forum.php, viewform.pho and viewtopic.php. I can see the blocks in every action, and they're right configured. 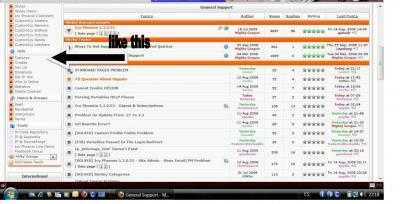 These blocks you can see them in forum.php and viewtopic.php, but in viewforum.pho, I can't see them. ¿What's the problem? Thanks. Have you enabled global blocks the cms permissions section..? Check again CMS configuration... and then empty your cache. I checked CMS and delet cache and the problem go on. Can you post a screenshots of the CMS section where Global Blocks and Permissions are set? Ok, it would appear that my site has the same issue that odelot is describing. I am running Icy Phoenix 1.3.0.53 with Black Pearl and MG Autumn in their default configuration. I downloaded IP and the termplates from here and made sure I downloaded the newest templates made for IP 1.3. My website is located at http://military-minds.endofinternet.org/ so you can see the problem I am describing. The only file I have made any modifications to directly is the lang_main_settings.php file with all other modifications having been done through ACM or ACP. I know just enough about PHP/HTML to be dangerous so make a point to post lots of questions before I get into the weeds. 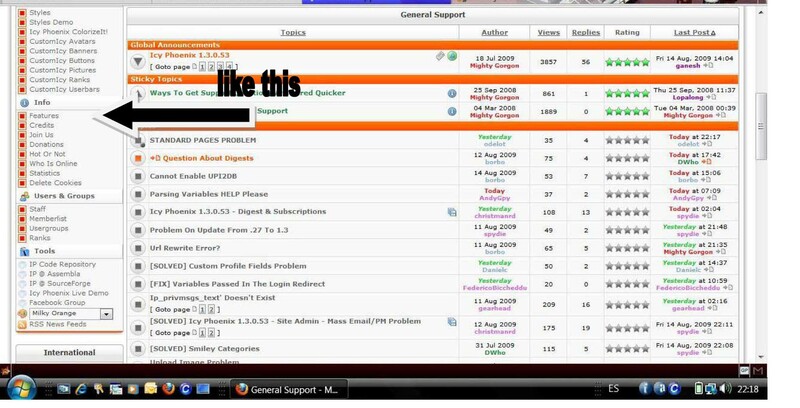 When accessing 'viewforum.php' there are no menus on the left side of the screen even though Global Blocks are activated for it. I have even gone into the Standard Pages menu and manually configured it to show the main menu by using both 'dyn menu [Dynamic Menu]' and 'nav links [Site Map]' but the menu still refuses to come up. I have cleared the cache through ACP for the board/template, verified the /cache folder was actually empty, then cleared all browser cache/cookies/files without resolving the issue. All the other "Standard Pages" display the left hand menu without issue. If screens shots or any further information is needed please let me know. Ok, not to put too fine a point on it but...I LOVE YOU MAN (in a purely non-sexual way). In all seriousness though I would like to thank you for finding this bug as this was starting to make me crazy and believing I screwed something up. If we ever crossed paths I would definitely buy you a beer.